If it seems like every AED uses a different battery, that’s because they do. Each manufacturer, with the exception of one, has a unique patented battery for use in their machines, designed to optimize the performance of their device. Most batteries used in AEDs are lithium batteries. While rechargeable batteries are available for most AEDs, the majority of batteries used are non-rechargeable. Lithium cells can produce voltages from 1.5v to about 3.9v, over twice the voltage of an ordinary zinc–carbon battery or alkaline battery. Lithium batteries also have a longer lifespan, which is how some AED manufacturers offer four to seven years of standby life on their lithium batteries. What is the difference in batteries across AED makes and models? Defibtech Lifeline™ & Defibtech Lifeline™ AUTO AEDs – lithium battery with a choice of either a five or seven year operating life in standby. This AED also has a 9V lithium battery compartment within the main battery which is used to perform self-checks so the main battery is not depleted. Defibtech Lifeline™ VIEW & Defibtech Lifeline™ ECG AEDs – lithium battery with a 4-year operating life in standby. HeartSine® samaritan® PAD 350P & HeartSine® samaritan® PAD 450P AEDs – combination electrode pad and lithium battery pak (Pad-Pak) with a 4-year operating life in standby. Philips HeartStart OnSite & Philips HeartStart FRx AEDs – lithium battery with a 4-year operating life in standby. Physio-Control LIFEPAK CR Plus & Physio-Control LIFEPAK Express AEDs – replaceable CHARGE-PAK™ trickle-charges the AED’s internal battery. The electrode pads and CHARGE-PAK™ are sold together and support a 2-year operating life in standby. Professional Model AEDs all use patented lithium batteries and have rechargeable options. Discontinued AEDs still in service may or may not still have batteries and other accessories available, depending on the make and model. TSO stands for Technical Standard Order and is a minimum performance standard for specified materials, parts, and appliances used on civil aircraft. When authorized to manufacture a material, part, or appliance to a TSO standard, this is referred to as TSO authorization. Receiving a TSO authorization requires both design and production approval. A TSO Authorization is not an approval to install and use the article in the aircraft, it only means the article meets the specific TSO and the applicant is authorized to manufacture it. Some manufacturers have received this authorization and those batteries are labeled as such for use in civil aircraft. This means an airline purchasing an AED for their airplane would purchase a TSO battery, but this would not be relevant for a passenger packing an AED in their baggage. Rechargeable batteries (lithium ion) can be carried on a plane in the device or as a spare, or can be checked as long as the battery is installed in the AED. LARGE non-rechargeable batteries, which are used in all AEDs except the ZOLL AED Plus and Physio-Control CR Plus, CANNOT be carried on or checked (because the batteries contain over two grams of lithium). SMALL non-rechargeable batteries like the ten used in the ZOLL AED Plus or the Physio-Control CR Plus/EXPRESS CHARGE-PAK CAN be carried on (in the device or as spares) but CANNOT be checked. AED batteries vary in their voltage and amp/hour statistics. 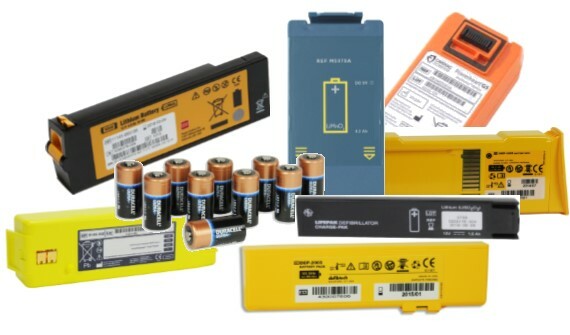 For detailed information on a specific battery feel free to contact us at info@aeds.com and we will be happy to supply that information for your specific battery.